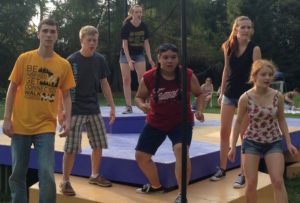 Delaware Shakespeare offers summer internships for high school actors who are interested in learning more about Shakespeare and being a part of a wonderful Delaware summer tradition. This is an incredible opportunity to be a part of our Summer Festival, getting an inside view of a professional theatre company working on one of the greatest plays ever written. In 2019, you can go behind the scenes (and on stage) as Delaware Shakespeare creates its production of The Merry Wives of Windsor. High school interns understudy the roles in the summer festival production played by College Apprentices. If schedules permit, interns are welcome to attend the three master classes offered to the Apprentice Company. All rehearsals for the summer production are open to interns to attend and observe. In 2019, select interns will appear on stage in the final scene of Merry Wives. Download the High School Intern Application. Email the completed form to David Stradley at david@delshakes.org. Deadline for applications to be submitted is May 13, 2019. Auditions will be held on Thursday, May 16.